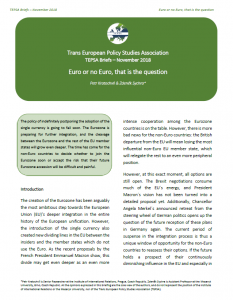 Let us introduce to you new TEPSA brief: “Euro or no Euro, that is the question”, written by our Senior Researcher Petr Kratochvíl and Zdeněk Sychra, Assistant Professor at the Masaryk University, Brno, Czech Republic. The authors argue that the policy of indefinitely postponing the adoption of the single currency is going to fail soon. The Eurozone is preparing for further integration, and the cleavage between the Eurozone and the rest of the EU member states will grow even deeper. The brief concludes that the time has come for the non-Euro countries to decide whether to join the Eurozone soon or accept the risk that their future Eurozone accession will be difficult and painful. You can read the brief here. The Trans European Policy Studies Association (TEPSA) is the first transeuropean research network in the field of European affairs. It consists of leading research institutes in the field of European affairs throughout Europe, with an office in Brussels. TEPSA is an international non-profit association under Belgian law (AISBL) and was established in 1974. Ever since then it has steadily increased its membership in response to the enlargement rounds of the European Union. Today TEPSA consists of 41 member institutes (including the IIR Prague) and associate members located in 35 European countries.